Incorporating scads of LEDs into an electronic project used to be a hairy prospect, a veritable rat’s nest of wires and code. The arrival of dedicated LED driver chips brought welcome relief, offloading grunt work from the microcontroller and allowing one to focus on the application. Much simpler, but still not “Christmas light” simple. The WS2812 Integrated Light Source — or NeoPixel in Adafruit parlance — is the latest advance in the quest for a simple, scalable and affordable full-color LED. Red, green and blue LEDs are integrated alongside a driver chip into a tiny surface-mount package controlled through a single wire. They can be used individually, chained into longer strings or assembled into still more interesting form-factors. We know you’re eager to get started…but If this is your first time using NeoPixels, please at least read the “Best Practices” page before connecting anything! Not all addressable LEDs are NeoPixels. 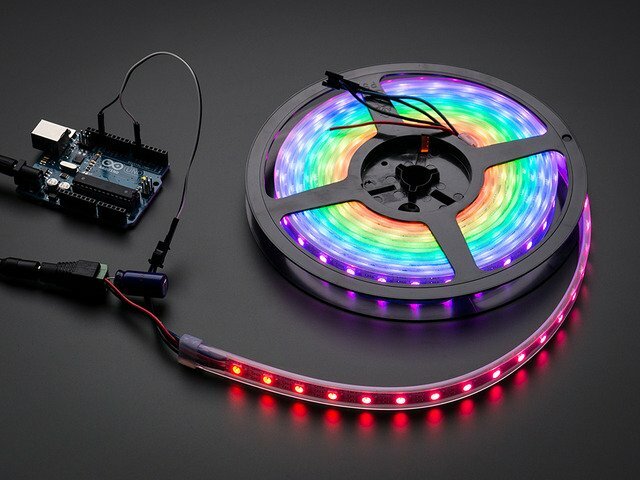 “NeoPixel” is Adafruit’s brand for individually-addressable RGB color pixels and strips based on the WS2812, WS2811 and SK6812 LED/drivers, using a single-wire control protocol. Other LED products we carry — DotStars, WS2801 pixels, LPD8806 and “analog” strips — use different methodologies (and have their own tutorials). When seeking technical support in the forums, a solution can be found more quickly if the correct LED type is mentioned, i.e. avoid calling DotStars “NeoPixels”…similar, but different! NeoPixels don’t just light up on their own; they require a microcontroller (such as Arduino) and some programming. We provide some sample code to get you started. To create your own effects and animation, you’ll need some programming practice. If this is a new experience, work through some of the beginning Arduino tutorials to get a feel for the language. NeoPixels aren’t the answer for every project. The control signal has very strict timing requirements, and some development boards (such as Netduino or Raspberry Pi) can’t reliably achieve this. This is why we continue to offer other LED types; some are more adaptable to certain situations. Can I use NeoPixels for POV (persistence of vision) displays? Not recommended. The refresh rate is relatively low (about 400 Hz), and color displays in fast motion may appear “speckled.” They look fine in stationary displays though (signs, decorations, jewelry, etc.). For POV use, DotStar strips will look much better (they have about a 20 KHz refresh rate). How about for light painting? Definitely! The slower movement used for photographic light painting doesn’t call attention to the limited refresh rate; the results look great, especially with a light diffuser. Is there a limit to the number of NeoPixels in a chain? RAM: NeoPixels require some RAM from the host microcontroller; more pixels = more RAM. It’s only a few bytes each, but as most microcontrollers are pretty resource-constrained, this becomes a very real consideration for large projects. Power: each NeoPixel draws a little bit of current; more pixels = more power. Power supplies likewise have some upper limit. Time: NeoPixels process data from the host microcontroller at a fixed data rate; more pixels = more time and lower animation frame rates. NeoPixel products are available in a zillion form factors…from individual tiny pixels to huge matrices…plus strips, rings and everything in-between. Pick a category from the left column for product links and tips & tricks specific to each type of NeoPixel. To get started, let’s assume you have some model of Arduino microcontroller connected to the computer’s USB port. We’ll elaborate on the finer points of powering NeoPixels later, but in general you’ll usually be using a 5V DC power supply (e.g. “wall wart”) or — for wearable projects — a 3.7 Volt lithium-polymer battery. Identify the “input” end of your NeoPixel strip, pixel(s) or other device. On some, there will be a solder pad labeled “DIN” or “DI” (data input). Others will have an arrow showing the direction that data moves. The data input can originate from any digital pin on the Arduino, but all the example code is set up for digital pin 6 by default. The NeoPixel shield comes wired this way. If using a Flora, Feather or other microcontroller board with an attached lithium-polymer battery: connect the +5V input on the strip to the pad labeled VBAT or BAT on the board, GND from the strip to any GND pad on the microcontroller board, and DIN to Flora pin D6. If the board doesn’t have a pin #6, you’ll need to modify the example code to change the pin number. For other Arduino boards with a separate +5V DC power supply for the NeoPixels: connect the +5V input on the strip to the + (positive) terminal on the power supply (don’t connect to the Arduino), DIN to digital pin 6 on the Arduino, and – (minus or GND) on the strip must connect to both the minus (–) terminal on the DC supply and a GND pin on the Arduino (there are usually several — any will do). The 144 pixel strips are so tightly packed, there’s no room for labels other than –, + and the data direction arrows. Data is the un-labeled pad. The order of the three pins can vary between different strip densities and batches. ALWAYS use the labels printed ON THE STRIP. Look closely, NEVER blindly follow a NeoPixel strip wiring diagram; it might be based on a different strip type! When connecting NeoPixels to any LIVE power source or microcontroller, ALWAYS CONNECT GROUND (–) BEFORE ANYTHING ELSE. Conversely, disconnect ground last when separating. When using a DC power supply, or an especially large battery, we recommend adding a large capacitor (1000 µF, 6.3V or higher) across the + and – terminals. This prevents the initial onrush of current from damaging the pixels. See the photo on the next page for an example. Can NeoPixels be powered directly from the Arduino’s 5V pin? Sometimes. The Arduino can continuously supply only about 500 milliamps to the 5V pin. Each NeoPixel can draw up to 60 milliamps at full brightness. So yes, you can skip the separate DC supply and power directly off the Arduino as long as just a few pixels are used, more if the colors and overall brightness are low. When in doubt, give the pixels a separate power supply. Before connecting NeoPixels to any large power source (DC “wall wart” or even a large battery), add a capacitor (1000 µF, 6.3V or higher) across the + and – terminals as shown above. The capacitor buffers sudden changes in the current drawn by the strip. Place a 300 to 500 Ohm resistor between the Arduino data output pin and the input to the first NeoPixel. The resistor should be at the end of the wire closest to the NeoPixel(s), not the microcontroller. Some products already incorporate this resistor…if you’re not sure, add one…there’s no harm in doubling up! Try to minimize the distance between the Arduino and first pixel, so the signal is clear. A meter or two is usually no problem. Much longer and things can become unreliable. Avoid connecting NeoPixels to a live circuit. If you simply must, always connect ground first, then +5V, then data. Disconnect in the reverse order. If powering the pixels with a separate supply, apply power to the pixels before applying power to the microcontroller. Observe the same precautions as you would for any static-sensitive part; ground yourself before handling, etc. Make sure that your connections are secure. Alligator clips do not make reliable connections to the tiny solder pads on NeoPixel rings. Better to solder a small pigtail wire to the ring and attach the alligator clips to that. If your microcontroller and NeoPixels are powered from two different sources (e.g. separate batteries for each), there must be a ground connection between the two. Some of our projects don’t make the above precautions…these are typically small battery-powered devices and power spikes aren’t a big concern. Any project with a lot pixels or a large power source should definitely include the power capacitor and data line resistor. Adding a 300 to 500 Ohm resistor between your microcontroller's data pin and the data input on the first NeoPixel can help prevent voltage spikes that might otherwise damage your first pixel. Please add one between your micro and NeoPixels! NeoPixels are usually described as “5 Volt devices,” but the reality is a little more nuanced than that. Some (not all) NeoPixel products can work with slightly higher voltages. This depends on the additional support components around the chip, based on available space, cost and the most likely application. Refer to the specific product description page for guidance on acceptable voltage limits for each type. When in doubt, aim for 5 Volts. Lower voltages are always acceptable, with the caveat that the LEDs will be slightly dimmer. There’s a limit below which the LED will fail to light, or will start to show the wrong color. Before connecting a NeoPixel strip to ANY source of power, we very strongly recommend adding a large capacitor (1000 µF, 6.3V or higher) across the + and – terminals. This prevents the initial onrush of current from damaging the pixels. For many wearable projects we recommend a lithium-polymer battery. These deliver 3.7 Volts — perfect for directly feeding low-power microcontrollers such as the Adafruit Flora, yet enough voltage to run a short length of NeoPixels. Three alkaline cells (such as AA batteries) can be installed in a battery holder to provide 4.5 Volts. Though larger and heaver than the fancy lithium-polymer pack, they’re inexpensive and readily available. Four nickel-metal hydride (NiMH) rechargeable cells can similarly be used in a 4-cell battery holder to provide 4.8 Volts. Make sure you only use NiMH cells in this configuration. Four alkaline cells (the disposable type) will output 6V total — that’s too high for some NeoPixels, and definitely too much for the microcontroller! Battery-operated LED project planning is discussed in greater detail in Battery Power for LED Pixels and Strips. For most non-portable “desktop” projects, a 5V DC switching power supply is ideal. This small 2 Amp supply is good for a a meter or so of NeoPixel strip. We’ll explain larger projects in a moment. Be extremely cautious with bench power supplies. Some — even reputable, well-regarded brands — can produce a large voltage spike when initially switched on, instantly destroying your NeoPixels! If you use a bench supply, do not connect NeoPixels directly. Turn on the power supply first, let the voltage stabilize, then connect the pixels (GND first). Each individual NeoPixel draws up to 60 milliamps at maximum brightness white (red + green + blue). In actual use though, it’s rare for all pixels to be turned on that way. When mixing colors and displaying animations, the current draw will be much less. It’s impossible to estimate a single number for all circumstances, but we’ve been using 1/3 this (20 mA per pixel) as a gross rule of thumb with no ill effects. But if you know for a fact that you need every pixel on at maximum brightness, use the full 60 mA figure. The choice of “overhead” in your power supply is up to you. Maximum safety and reliability are achieved with a more generously-sized power supply, and this is what we recommend. Most power supplies can briefly push a little extra current for short periods. Many contain a thermal fuse and will simply shut down if overworked. So they may technically work, but this is the electronics equivalent of abusing a rental car. Keep in mind, 60 mA is a worst case estimate! We’ve written a whole separate tutorial on getting things under control: Sipping Power with NeoPixels. I estimate I need a 3.6 Amp power supply. I have a 10 Amp supply on-hand. Will this cause my NeoPixels to explode? As long as the output is 5 Volts DC, you’re golden. The LEDs will only draw as much current (Amperes) as they need. So extra Amps are OK — in fact, it can be a good thing. The larger power supply will run cooler because it’s not being pushed to its limit. Excessive voltage, however, will definitely kill your LEDs. Extra Amps = good. Extra Volts = bad. What about batteries and “Amp hours”? Amp-hours are current over time. A 2,600 mAh (milliamp-hour) battery can be thought of as delivering 2.6 Amps continuously for one hour, or 1.3 Amps for 2 hours, and so forth. In reality, it’s not quite linear like that; most batteries have disproportionally shorter run times with a heavy load. Also, most batteries won’t take kindly to being discharged in an hour — this can even be dangerous! Select a battery sufficiently large that it will take at least a couple hours to run down. It’s both safer for you and better for the longevity of the battery. I need to power LOTS of NeoPixels and don’t have a power supply that large. Can I use several smaller ones? Maybe. There are benefits to using a single supply, and large power supplies are discussed below. “Non-optimal” doesn’t necessarily mean “pessimal” though, and we wouldn’t discourage anyone from using what resources they have. If you go this route, the key is to have all of the ground pins among the strips connected in common, but the +5V from each power supply should be connected only to one length of NeoPixels — those should not all be joined. Every power supply is a little different — not precisely 5 Volts — and this keeps some from back-feeding into others. Adafruit offers 5V DC power supplies up to 10 Amps. This is usually sufficient for a couple hundred NeoPixels or more. For really large installations, you’ll need to look elsewhere. One possibility is to repurpose an ATX computer power supply. The nice beefy server types often provide up to 30 Amps. Some minor modifications are needed…Google around for “ATX power supply hack.” Note that the ATX 5V rail can be very unstable if there's no load on the 12V rail! Please note that projects of this scale are potentially very dangerous, and the problems of power distribution are fundamentally different than hobby-scale projects. As much as we enjoy helping our customers in the forums, they are for product technical support and not full-on engineering services. If you’re developing a project of this scope, hire a professional electrician with experience in high-power, low-voltage systems such as photovoltaics or large RVs and boats. This is no charade. The longer a wire is, the more resistance it has. The more resistance, the more voltage drops along its length. If voltage drops too far, the color of NeoPixels can be affected. Consider a full 4 meter reel of NeoPixels. With 5V applied at one end of the strip, for those pixels closest to this end, power traverses only a few inches of copper. But at the far end of the strip, power traverses 8 meters of copper — 4 meters out on the +5V line, 4 meters back on the ground line. Those furthest pixels will be tinted brown due to the voltage drop (blue and green LEDs require higher voltage than red). Pro Tip: NeoPixels don’t care what end they receive power from. Though data moves in only one direction, electricity can go either way. You can connect power at the head, the tail, in the middle, or ideally distribute it to several points. For best color consistency, aim for 1 meter or less distance from any pixel to a power connection. With larger NeoPixel setups, think of power distribution as branches of a tree rather than one continuous line. Resistance is just as much a concern on tiny projects too! For wearable electronics we like conductive thread…it’s flexible and withstands hand washing. Downside is that it doesn’t carry much current. Here several strands of conductive thread have been grouped to provide better capacity for the + and – conductors down a pair of suspenders. Increasingly, microcontrollers are running at 3.3 Volts instead of 5 Volts. That’s great news for efficiency, but can present a communication problem with 5V NeoPixels. The 3.3V signal from the microcontroller may not be “loud” enough to register with the higher-voltage device. The manufacturer recommends a minimum signal voltage of 70% of the NeoPixel voltage. Lower the voltage to the NeoPixels so it’s closer (or equal) to that of the microcontroller. This is why we recommend LiPo batteries for FLORA projects: 3.7V is enough to run a short length of pixels, and the microcontroller is comfortable at that voltage as well. Use a logic level shifter to step up the signal from the microcontroller to the first pixel. NeoPixels got their start on Arduino, but have since branched out to other boards and languages. Pick a category from the left column for information specific to each coding environment. It's easy to use NeoPixel LEDs with Python or CircuitPython and the Adafruit CircuitPython NeoPIxel module. This module allows you to easily write Python code that controls your LEDs. You can use these LEDs with any CircuitPython microcontroller board or with a computer that has GPIO and Python thanks to Adafruit_Blinka, our CircuitPython-for-Python compatibility library. First wire up some NeoPixels to your board exactly as shown on the previous pages. Verify your connection is on the DATA INPUT or DIN side. Plugging into the DATA OUT or DOUT side is a common mistake! The connections are labeled and some formats have arrows to indicate the direction the data must flow. Since there's dozens of Linux computers/boards you can use we will show wiring for Raspberry Pi. For other platforms, please visit the guide for CircuitPython on Linux to see whether your platform is supported. On the Raspberry Pi, NeoPixels must be connected to GPIO10, GPIO12, GPIO18 or GPIO21 to work! You'll need to install the Adafruit CircuitPython NeoPixel library on your CircuitPython board. Next you'll need to install the necessary libraries to use the hardware--carefully follow the steps to find and install these libraries from Adafruit's CircuitPython library bundle. Our CircuitPython starter guide has a great page on how to install the library bundle. Before continuing make sure your board's lib folder or root filesystem has the neopixel.mpy, and adafruit_bus_device files and folders copied over. You'll need to install the Adafruit_Blinka library that provides the CircuitPython support in Python. This may also require verifying you are running Python 3. Since each platform is a little different, and Linux changes often, please visit the CircuitPython on Linux guide to get your computer ready! If your default Python is version 3 you may need to run 'pip' instead. Just make sure you aren't trying to use CircuitPython on Python 2.x, it isn't supported! To demonstrate the usage of this library with NeoPixel LEDs, we'll use the board's Python REPL. For NeoPixels to work on Raspberry Pi, you must run the code as root! Root access is required to access the RPi peripherals. Run the following code to import the necessary modules and initialise a NeoPixel strip with 30 LEDs. Don't forget to change the pin if your NeoPixels are connected to a different pin, and change the number of pixels if you have a different number. pixels = neopixel.NeoPixel(board.D5, 30)    # Feather wiring! # pixels = neopixel.NeoPixel(board.D18, 30) # Raspberry Pi wiring! fill - Color all pixels a given color. show - Update the LED colors if auto_write is set to False. That's all there is to getting started with CircuitPython and NeoPixel LEDs! # The order of the pixel colors - RGB or GRB. Some NeoPixels have red and green reversed! # For RGBW NeoPixels, simply change the ORDER to RGBW or GRBW. # Input a value 0 to 255 to get a color value. # The colours are a transition r - g - b - back to r.
Many of the examples work right in your browser with Circuit Playground Express and its 10 built-in NeoPixel LEDs. There’s even a page explaining how to use MakeCode with external strips as well. Though strips are described as “flexible,” they do not tolerate continuous and repeated bending. “Formable” might be a better word. A typical application is architecture, where they can be curved around columns and then stay put. Repeated flexing (as on costumes) will soon crack the solder connections. For wearable use, either affix shorter segments to a semi-rigid base (e.g. a hat, BMX armor, etc. ), or use the individual sewable NeoPixels shown later. Watch your power draw. Though each pixel only needs a little current, it adds up fast…NeoPixel strips are so simple to use, one can quickly get carried away! We’ll explain more on the “Powering NeoPixels” page. 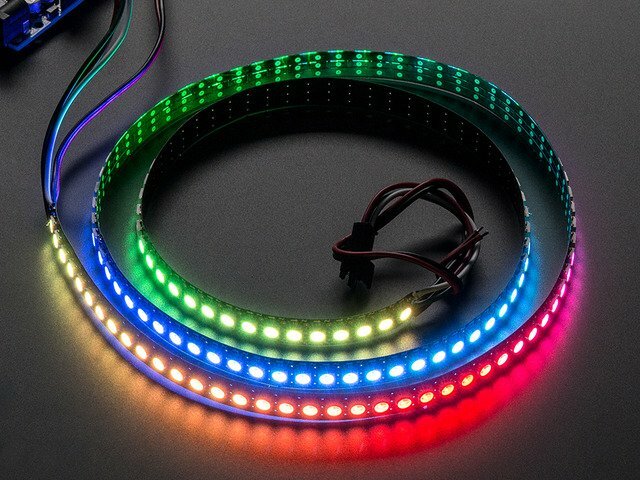 NeoPixel Digital RGB LED Weatherproof Strip is available in three different “densities”: 30, 60 and 144 LEDs per meter, on a white or black backing strip. 30 LEDs: 9 Watts (about 1.8 Amps at 5 Volts). 60 LEDs: 18 Watts (about 3.6 Amps at 5 Volts). 144 LEDs : 43 watts (8.6 Amps at 5 Volts). Mixed colors and lower brightness settings will use proportionally less power. 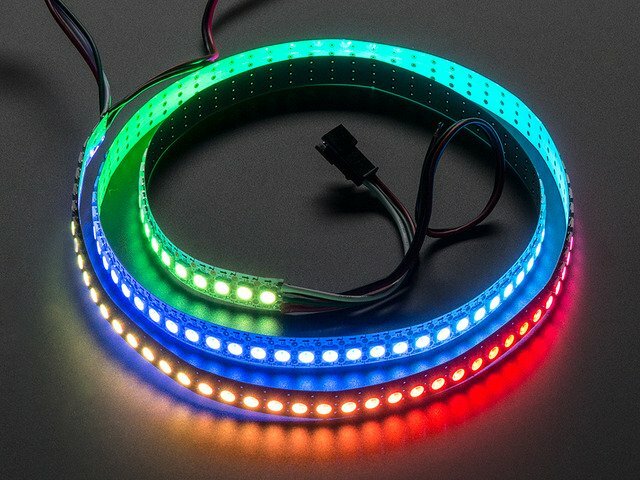 For those using Circuit Playground Express or just needing a “no soldering” option (as in most classrooms), we have a special half-meter, 30-LED NeoPixel strip with alligator clips attached. Easy! 30 and 60 LED/meter strips are 7.5 mm wide, or 5 mm if you remove the strip from the casing (vs 12.5 mm / 10 mm for classic strips). The high-density 144/m strips are about 10 mm wide, or 7.5mm with the casing removed. Power requirements are similar to standard-width NeoPixel strips as described above. A recent addition is RGBW NeoPixel strips. These add a fourth LED element — pure white — which is more “true” and pleasing to the eye than white mixed from red+green+blue. Like the RGB strips, they’re available in different pixel densities and backing strip colors. Width is the same as “classic” NeoPixel strip…these are not the “skinny” size. 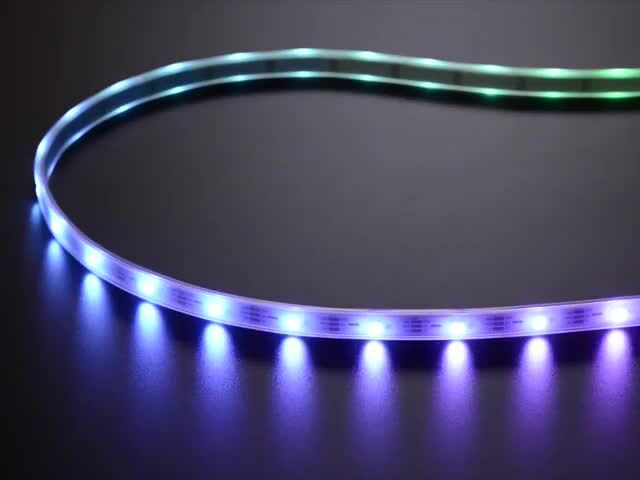 This distinctive NeoPixel flex strip has a gorgeous diffused neon-like appearance thanks to its thick silicone casing. This strip contains 60 LED along the meter but in groups of 3-LEDs-per-pixel. So basically, in your NeoPixel program, this looks like a 20-pixel-long strand. Unlike the other varieties of NeoPixel strip, this one needs to be powered from 9 Volts (minimum) to 12 Volts (ideal) DC. This can provide unusual effects when combined with UV-reactive paints, fluorescent laser-cut acrylic, etc. The usual NeoPixel R, G and B channels translate to three individual UV diodes. So we recommend you pretty much just set all three channels to the same value, ranging from (0, 0, 0) to (255, 255, 255). Same width as “classic” NeoPixel strip, and power draw at full brightness should be just a bit more than RGB 30/m: about 9.6W/meter (1.9A @ 5V). Like NeoPixel strips, these “strands” are flexible and can be wrapped around things. The pixels are spaced further apart (2 or 4 inches) with each pixel is sealed in its own tiny plastic capsule, making them weatherproof (but not rated for continuous submersion). There are 20 pixels in a strand. 144 pixel/m NeoPixel strips and 32/m UV strips are sold in one meter lengths. Each meter is a separate strip with end connectors. Longer contiguous lengths are not offered in 144 pixels/m RGB, RGBW or 32/m UV. 30 and 60 pixel/m NeoPixel strips are sold in one meter multiples. Orders for multiple meters will be a single contiguous strip, up to a limit: 4 meters for 60 pixels/m strip, 5 meters for 30 pixels/m. For 30 and 60 pixels/meter strips, if purchasing less than a full reel (4 or 5 meters, respectively), the strip may or may not have 3-pin JST plugs soldered at one or both ends. These plugs are for factory testing and might be at either end — the plug does not always indicate the input end! Arrows printed on the strip show the actual data direction. You may need to solder your own wires or plug. The flex strips are enclosed in a weatherproof silicone sleeve, making them immune to rain and splashes, but are not recommended for continuous submersion. Early 144 pixel/meter strips were not weatherproof, but the current inventory now offers this feature. The silicone sleeve can be cut and removed for a slimmer profile, but this compromises the strip's weather resistance. Very few glues will adhere to the weatherproof silicone sleeve. Using zip ties for a “mechanical” bond is usually faster and easier. The only reliable glues we’ve found are Permatex 66B Clear RTV Silicone (not all silicone glues will work!) and Loctite Plastics Bonding System, a 2-part cyanoacrylate glue. Customers have reported excellent results with Permatex Ultra Grey Silicone Gasket Maker as well. However, do not use Permatex 66B silicone to seal the open end of a cut strip! Like many RTV silicones, 66B releases acetic acid when curing, which can destroy electronics. It’s fine on the outside of the strip, but not the inside. Use GE Silicone II for sealing strip ends, or good ol’ hot melt glue. 2-sided carpet tape provides a light grip on the silicone sleeve; something like a Post-It Note. Or you can try clear duct tape over the top. 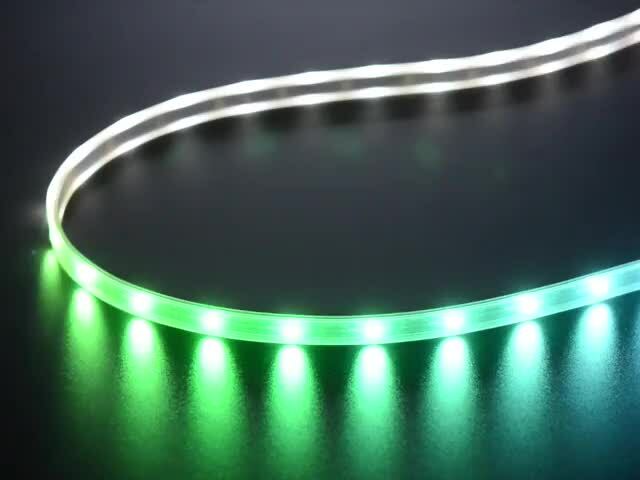 All LED strips are manufactured in 1/2 meter segments that are then joined into a longer strip. The pixel spacing across these joins is usually 2-3 millimeters different than the rest. This is not a manufacturing mistake, just physical reality. Some batches of 144 pixel strip don’t have pads between the LEDs. If you cut these into shorter sections, the only way to connect to them (except at the half-meter segments) is to carefully solder directly to the LED. The corner with the notch is the GND pin. NeoPixel rings are offered in 12, 16, 24 and 60 pixel varieties. 60-pixel rings are actually sold as 15-pixel quarters. For a full circle, you’ll need to purchase 4 and solder them together. Or you might find creative ideas for individual arcs! All rings are about 3.6 millimeters / 0.15" thick (1.6 mm for PCB, 2 mm for NeoPixels). RGB NeoPixels are the most affordable and can produce millions of color combinations. Cool white: approximately 6000 Kelvin (K). RGBW pixels incorporate a translucent diffuser layer to help mix and soften the light output. This makes them appear less intense than RGB pixels (which are “water clear”), but it’s really the same LEDs inside. When soldering wires to these rings, you need to be extra vigilant about solder blobs and short circuits. The spacing between components is very tight! It’s often easiest to insert the wire from the front and solder on the back. There’s also a 24-pixel RGB ring specifically designed for the Particle (formerly Spark) Photon development board. This one’s not “see-through” like the others — the space at the center provides a socket for the Photon board. NeoPixel matrices are two-dimensional grids of NeoPixels, all controlled from a single microcontroller pin. Like NeoPixel rings, these 64-pixel matrices are assembled on a rigid printed circuit board and are available in both RGB and RGBW varieties. All measure 71 millimeters (2.8 inches) square and about 3.6 mm thick. There are several mounting holes, and the DOUT pin allows multiple matrices to be linked in series. 320 mm x 80 mm / 12.6" x 3"
Flex matrices are about 2 millimeters (0.08 inches) thick. Flex matrices are available with RGB pixels only; RGBW is not offered. As mentioned on the NeoPixel Strips page, keep power consumption in mind when working with NeoPixel matrices. With so many pixels at your disposal, it’s easy to get carried away. If you need a size or shape of NeoPixel matrix that’s not offered here, it’s possible to create your own using sections of NeoPixel strip! NeoPixel matrices don’t enforce any particular “topology” — some may have rows of pixels arranged left-to-right, others may alternate left-to-right and right-to-left rows, or they could be installed in vertical columns instead. This will require some planning in your code. Our NeoMatrix library supports most matrix topologies. We also have a few special-purpose matrices on the NeoPixel Shields page! By default, the LEDs are powered from the Arduino’s 5V pin. As long as you aren't lighting up all the pixels at full brightness that should be fine. Or power the shield with an external power supply by soldering the included terminal block. The NeoPixels are controlled on digital pin 6, but with some deft wiring you could change this to any pin. Quite possibly The Cutest Thing in the History of Cute Little Things, the NeoPixel FeatherWing is is 4x8 pixel matrix that fits perfectly atop any of our Feather microcontroller boards. The NeoPixels are normally controlled from digital pin 6, but pads on the bottom make this reassignable. In particular, the default pin for Feather Huzzah ESP8266 must be moved, try pin #15! The NeoPixel Featherwing is RGB only; there’s no RGBW version. The Pimoroni Unicorn Hat is aptly named after a mythical animal — normally we’ll say that NeoPixels don’t work with the Raspberry Pi, but Pimoroni has worked up some magical software that makes this combination possible! It’s an 8x8 RGB matrix that fits neatly atop the Raspberry Pi Model A+, B+ or Pi 2. Due to the way Unicorn HAT works, you can't use your Pi's analog audio alongside it. If you see odd random colour patterns and flickering make sure analog audio is disabled. Previously mentioned on the “Rings” page, but for posterity: this 24-pixel RGB ring is specifically designed for the Particle (formerly Spark) Photon development board. The simplest thing…a row of 8 NeoPixels along a rigid circuit board. These make great bargraph indicators! Like our rings and matrices, NeoPixel sticks are available in RGB and RGBW varieties. All measure 51.1 x 10.2 millimeters (2.0 x 0.4 inches). When you need more “punch” than a single NeoPixel can provide, these 7-pixel jewels provide a lot of light in a compact shape. Again, RGB and RGBW varieties are available. All measure 23 millimeters (0.9 inches) in diameter. Though originally designed to be used in groups of four to complete a 60 NeoPixel Ring, the individual 15-pixel quarter rings can also be used to solve interesting design problems! RGB and RGBW are available. A half-meter rigid PCB tightly packed with 60 side-light NeoPixels. This is a strange animal but might be just the thing for compact light-painting projects or edge-lit signage. What might you make of it? If you need just a small number of pixels…or if ready-made shapes and strips don’t quite provide what you’re after…individual NeoPixels provide the most control over placement and quantity. Some individual NeoPixel products come ready to use, with a small PCB holding the LED, a decoupling capacitor for power, and points for connecting wires. Pack of 4, ready to use as-is. Sheet of 20, cut them off the sheet as you need them and save a little money. Flora RGB Smart Pixels measure about 12.5 millimeters (0.5 inches) in diameter. These are RGB only; there’s no RGBW version. Sheet of 25, cut off as needed. For both types, headers are optional and not included. Breadboard-Friendly NeoPixels measure 10.2 x 12.7 millimeters (0.4 x 0.5 inches) and are RGB only; there’s no RGBW version. NeoPixel Mini PCB — sold in packs of 5 — are the smallest ready-to-use NeoPixel format. These have no mounting holes or soldering vias…wires must be soldered directly to pads on the back of the PCB. Each is about 10 millimeters (0.3 inches) in diameter. These are RGB only; there’s no RGBW version. For advanced users needing fully customized designs, discrete NeoPixel components are available. You’ll need to provide your own PCB and (depending on the pixel type) surface-mount soldering skill. It’s very strongly recommended that each NeoPixel have an accompanying 0.1 μF capacitor between +V and ground. This prevents communication problems due to brownout of the on-pixel driver logic. It’s occasionally sufficient to have one capacitor between pairs of pixels; some of our NeoPixel rings work that way. 8mm Diffused – pack of 5. 5mm Diffused – pack of 5. 5mm Clear have been discontinued, but the product page is still available if you require pinout information. Through-hole NeoPixels are RGB only; there’s no RGBW version. Use of a 0.1 μF capacitor between + and ground on each pixel is strongly encouraged. 5050 RGB LED – pack of 10. RGBW NeoPixel – Cool White – white case – pack of 10. RGBW NeoPixel – Neutral White – white case – pack of 10. RGBW NeoPixel – Warm White – white case – pack of 10. RGBW NeoPixel – Cool White – black case – pack of 10. RGBW NeoPixel – Neutral White – black case – pack of 10. RGBW NeoPixel – Warm White – black case – pack of 10. NeoPixel – Cool White (3X white, no RGB) – pack of 10. NeoPixel – Warm White (3X white, no RGB) – pack of 10. All measure 5 millimeters square. Adding a 0.1 μF capacitor between + and ground is recommended for each pixel. The white- and black-cased pixels are functionally identical; this is purely an aesthetic choice for your design. “Cool white” measures approximately 6000 Kelvin. “Neutral white” is approx. 4500K. “Warm White” is approx. 3000K. Tiny surface-mount “3535” (3.5 millimeters square) NeoPixels are available in two RGB versions; no RGBW is available. NeoPixel Mini 3535 RGB – white case – pack of 10. NeoPixel Mini 3535 RGB – black case – pack of 10. Decoupling capacitor recommended. As with the “5050” NeoPixels, white- and black-cased versions are functionally identical, this is an aesthetic design option. The NeoPixel driver logic is available separately from the LEDs, allowing power-users to create extremely customized designs…perhaps using other LED colors, or combined with power MOSFETs to control high-current LEDs or “analog” RGB LED strips using the NeoPixel protocol. These require circuit design skills, custom PCBs and fine surface-mount soldering. A 0.1 uF decoupling capacitor is recommended for each chip. Controlling NeoPixels “from scratch” is quite a challenge, so we provide a library letting you focus on the fun and interesting bits. The library works with most mainstream Arduino boards and derivatives: Uno, Mega, Leonardo, Micro, Adafruit Flora, etc. — most anything with an Atmel AVR 8-bit processor from 8 to 16 MHz — and also works with the Arduino Due and all varieties of the PJRC Teensy boards. Because processor-specific assembly language is used, this library does not work on Netduino, ChipKIT or other advanced “Arduino-like” boards. Others may have written code and libraries for such boards, but we’re not able to provide technical support for any bugs or trouble you might encounter there; it’s some real frontier engineering. Some of these alternative libraries are covered in the “Advanced Coding” section. Recent versions of the Arduino IDE (1.6.2 and later) make library installation super easy via the Library Manager interface. From the Sketch menu, > Include Library > Manage Libraries... In the text input box type in "NeoPixel". Look for "Adafruit NeoPixel by Adafruit" and select the latest version by clicking on the popup menu next to the Install button. Then click on the Install button. After it's installed, you can click the "close" button. Uncompress the ZIP file after it’s finished downloading. The resulting folder should contain the files Adafruit_NeoPixel.cpp, Adafruit_NeoPixel.h and an “examples” sub-folder. Sometimes in Windows you’ll get an intermediate-level folder and need to move things around. Rename the folder (containing the .cpp and .h files) to Adafruit_NeoPixel (with the underscore and everything), and place it alongside your other Arduino libraries, typically in your (home folder)/Documents/Arduino/Libraries folder. Libraries should never be installed in the “Libraries” folder alongside the Arduino application itself…put them in the subdirectory of your home folder. Re-start the Arduino IDE if it’s currently running. Here’s a tutorial that walks through the process of correctly installing Arduino libraries manually. Select your board type and serial port from the Tools menu, and try uploading to the board. If the NeoPixels are connected and powered as previously described, you should see a little light show. Check your connections. The most common mistake is connecting to the output end of a strip rather than the input. Something happens but the LEDs are blinking in a weird way! and reupload the strandtest example. I don't have RGBW LEDs and the LEDs are still blinking weird! 99% of the time this is due to not having a shared ground wire connected to the Arduino. Make sure the Ground wire from the Neopixels connects to BOTH your power supply ground AND the Arduino ground. Doxygen-generated documentation for the Adafruit_NeoPixel library is available here. It’s assumed at this point that you have the Adafruit_NeoPixel library for Arduino installed and have run the strandtest example sketch successfully. If not, return to the prior page for directions to set that up. // Which pin on the Arduino is connected to the NeoPixels? // How many NeoPixels are attached to the Arduino? The first few lines assign numbers to the symbols “LED_PIN” and “LED_COUNT” for later reference. It doesn’t need to be done this way, but makes it easier to change the pin and length where the NeoPixels are connected without digging deeper into the code. The number of sequential NeoPixels in the strip. In the example this is set to LED_COUNT, which was defined as 60 above, equal to 1 meter of medium-density strip. Change this to match the actual number you’re using. The pin number to which the NeoPixel strip (or other device) is connected. Normally this would be a number, but we previously declared the symbol LED_PIN to refer to it by name here. A value indicating the type of NeoPixels that are connected. In most cases you can leave this off and pass just two arguments; the example code is just being extra descriptive. If you have a supply of classic “V1” Flora pixels, those require NEO_KHZ400 + NEO_RGB to be passed here. RGBW NeoPixels also require a different value here: NEO_RGBW. The second line, strip.show(), isn’t absolutely necessary, it’s just there to be thorough. That function pushes data out to the pixels…since no colors have been set yet, this initializes all the NeoPixels to an initial “off” state in case some were left lit by a prior program. The Adafruit Trinket 5V 16 MHz board requires a little extra setup. You can see the steps required in the “strandtest” example sketch. In the strandtest example, loop() doesn’t set any pixel colors on its own — it calls other functions that create animated effects. So let’s ignore it for now and look ahead, inside the individual functions, to see how the strip is controlled. The first argument — n in this example — is the pixel number along the strip, starting from 0 closest to the Arduino. If you have a strip of 30 pixels, they’re numbered 0 through 29. It’s a computer thing. You’ll see various places in the code using a for loop, passing the loop counter variable as the pixel number to this function, to set the values of multiple pixels. The next three arguments are the pixel color, expressed as red, green and blue brightness levels, where 0 is dimmest (off) and 255 is maximum brightness. The last optional argument is for white, which will only be used if the strip was defined during creation as an RGBW type and the strip actually is RGBW type. Here, color is a 32-bit type that merges the red, green and blue values into a single number. This is sometimes easier or faster for some (but not all) programs to work with; you’ll see the strandtest code uses both syntaxes in different places. Then later you can just pass “magenta” as an argument to setPixelColor rather than the separate red, green and blue numbers every time. This updates the whole strip at once, and despite the extra step is actually a good thing. If every call to setPixelColor() had an immediate effect, animation would appear jumpy rather than buttery smooth. “color” is a packed 32-bit RGB (or RGBW) color value, as might be returned by strip.Color(). There is no option here for separate red, green and blue, so call the Color() function to pack these into one value. “first” is the index of the first pixel to fill, where 0 is the first pixel in the strip, and strip.numPixels() - 1 is the last. Must be a positive value or 0. “count” is the number of pixels to fill. Must be a positive value. If called without a count argument (only color and first), this will from first to the end of the strip. If called without first or count arguments (only color), the full strip will be set to the requested color. This returns a 32-bit merged RGB color value. This is always RGB, even if the “ColorHSV()” function (described below) was used. Just like setPixel(), this does not have an immediate effect. You need to follow this with a call to show(). setBrightness() was intended to be called once, in setup(), to limit the current/brightness of the LEDs throughout the life of the sketch. It is not intended as an animation effect itself! The operation of this function is “lossy” — it modifies the current pixel data in RAM, not in the show() call — in order to meet NeoPixels’ strict timing requirements. Certain animation effects are better served by leaving the brightness setting at the default maximum, modulating pixel brightness in your own sketch logic and redrawing the full strip with setPixel(). The NeoPixel library has some support for colors in the “HSV” (hue-saturation-value) color space. This is a different way of specifying colors than the usual RGB (red-green-blue). Some folks find it easier or more “natural” to think about…or quite often it’s just easier for certain color effects (the popular rainbow cycle and such). In the NeoPixel library, hue is expressed as a 16-bit number. Starting from 0 for red, this increments first toward yellow (around 65536/6, or 10922 give or take a bit), and on through green, cyan (at the halfway point of 32768), blue, magenta and back to red. In your own code, you can allow any hue-related variables to overflow or underflow and they’ll “wrap around” and do the correct and expected thing, it’s really nice. Saturation determines the intensity or purity of the color…this is an 8-bit number ranging from 0 (no saturation, just grayscale) to 255 (maximum saturation, pure hue). In the middle, you’ll start to get sort of pastel tones. Value determines the brightness of a color…it’s also an 8-bit number ranging from 0 (black, regardless of hue or saturation) to 255 (maximum brightness). There is no corresponding function to go the other way, from RGB to HSV. This is on purpose and by design, because conversion in that direction is often ambiguous — there may be multiple valid possibilities for a given input. If you look at some of the example sketches you’ll see they keep track of their own hues…they don’t assign colors to pixels and then try to read them back out again. Something you might observe when working with more nuanced color changes is that things may appear overly bright or washed-out. It’s generally not a problem with simple primary and secondary colors, but becomes more an issue with blends, transitions, and the sorts of pastel colors you might get from the ColorHSV() function. Numerically the color values are correct, but perceptually our eyes make something different of it, as explained in this guide. The gamma32() function takes a packed RGB value (as you might get out of Color() or ColorHSV()) and filters the result to look more perceptually correct. You might notice in strandtest and other example sketches that we never use ColorHSV() without passing the result through gamma32() before setting a pixel’s color. It’s that desirable. However, the gamma32 operation is not built in to ColorHSV() — it must be called as a separate operation — for a few reasons, including that advanced programmers might want to provide a more specific color-correction function of their own design (gamma32() is a “one size fits most” approximation) or may need to keep around the original “numerically but not perceptually correct” numbers. There is no corresponding reverse operation. When you set a pixel to a color filtered through gamma32(), reading back the pixel value yields that filtered color, not the original RGB value. It’s precisely because of this sort of decimation that advanced NeoPixel programs often treat the pixel buffer as a write-only resource…they generate each full frame of animation based on their own program state, not as a series of read-modify-write operations. I’m calling setPixel() but nothing’s happening! forgetting to call strip.begin() in setup(). forgetting to call strip.show() after setting pixel colors. Another (less common) possibility is running out of RAM — see the last section below. If the program sort of works but has unpredictable results, consider that. Can I have multiple NeoPixel objects on different pins? The above declares two distinct NeoPixel objects, one each on pins 5 and 6, each containing 16 pixels and using the implied default type (NEO_KHZ800 + NEO_GRB). Can I connect multiple NeoPixel strips to the same Arduino pin? In many cases, yes. All the strips will then show exactly the same thing. This only works up to a point though…four strips on a single pin is a good and reliable number. 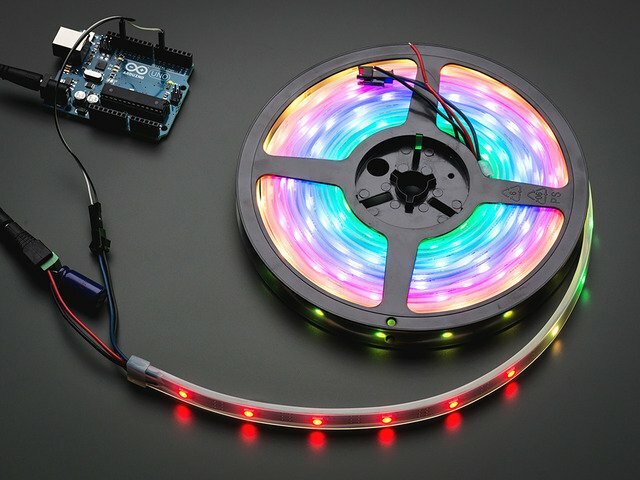 If you need more than that, individual NeoPixels can be used as buffers to “fan out” to more strips: connect one Arduino pin to the inputs of four separate NeoPixels, then connect each pixels’ output to the inputs of four strips (or fewer, if you don’t need quite that many). If the strips are 10 pixels long, declare the NeoPixel object as having 11 pixels. The extra “buffer” pixels will be at position #0 — just leave them turned off — and the strips then run from positions 1 through 10. I'm getting the wrong colors. Red and blue are swapped! When using through-hole 8mm NeoPixels (or V1 Flora pixels), use NEO_RGB for the third parameter in the Adafruit_NeoPixel declaration. For all other types of NeoPixels, use NEO_GRB. The colors fall apart when I use setBrightness() repeatedly! See note above; setBrightness() is designed as a one-time setup function, not an animation effect. Also see the “Advanced Coding” page — there’s an alternative library that includes “nondestructive” brightness adjustment, among other features! Each NeoPixel requires about 3 bytes of RAM. This doesn’t sound like very much, but when you start using dozens or even hundreds of pixels, and consider that the mainstream Arduino Uno only has 2 kilobytes of RAM (often much less after other libraries stake their claim), this can be a real problem! For using really large numbers of LEDs, you might need to step up to a more potent board like the Arduino Mega or Due. But if you’re close and need just a little extra space, you can sometimes tweak your code to be more RAM-efficient. This tutorial has some pointers on memory usage. The Adafruit_NeoMatrix library builds upon Adafruit_NeoPixel to create two-dimensional graphic displays using NeoPixels. You can then easily draw shapes, text and animation without having to calculate every X/Y pixel position. Small NeoPixel matrices are available in the shop. Larger displays can be formed using sections of NeoPixel strip, as shown in the photo above. If you’ve previously used any Adafruit LCD or OLED displays, you might already have the latter library installed. Installation for both is similar to Adafruit_NeoPixel before: unzip, make sure the folder name matches the .cpp and .h files within, then move to your Arduino libraries folder and restart the IDE. Adafruit_NeoMatrix uses exactly the same coordinate system, color functions and graphics commands as the Adafruit_GFX library. If you’re new to the latter, a separate tutorial explains its use. There are also example sketches included with the Adafruit_NeoMatrix library. We’ll just focus on the constructor here — how to declare a two-dimensional display made from NeoPixels. Powering the beast is another matter, covered on the prior page. Let’s begin with the declaration for a single matrix, because it’s simpler to explain. We’ll be demonstrating the NeoPixel Shield for Arduino in this case — an 8x5 matrix of NeoPixels. When looking at this shield with the text in a readable orientation, the first pixel, #0, is at the top left. Each successive pixel is right one position — pixel 1 is directly to the right of pixel 0, and so forth. At the end of each row, the next pixel is at the left side of the next row. This isn’t something we decide in code…it’s how the NeoPixels are hard-wired in the circuit board comprising the shield. We refer to this layout as row major and progressive. Row major means the pixels are arranged in horizontal lines (the opposite, in vertical lines, is column major). Progressive means each row proceeds in the same direction. Some matrices will reverse direction on each row, as it can be easier to wire that way. We call that a zigzag layout. Now the first pixel is at the top right. Pixels increment top-to-bottom — it’s now column major. The order of the columns is still progressive though. The first two arguments — 5 and 8 — are the width and height of the matrix, in pixels. The third argument — 6 — is the pin number to which the NeoPixels are connected. On the shield this is hard-wired to digital pin 6, but standalone matrices are free to use other pins. The next argument is the interesting one. This indicates where the first pixel in the matrix is positioned and the arrangement of rows or columns. The first pixel must be at one of the four corners; which corner is indicated by adding either NEO_MATRIX_TOP or NEO_MATRIX_BOTTOM to either NEO_MATRIX_LEFT or NEO_MATRIX_RIGHT. The row/column arrangement is indicated by further adding either NEO_MATRIX_COLUMNS or NEO_MATRIX_ROWS to either NEO_MATRIX_PROGRESSIVE or NEO_MATRIX_ZIGZAG. These values are all added to form a single value as in the above code. The last argument is exactly the same as with the NeoPixel library, indicating the type of LED pixels being used. In the majority of cases with the latest NeoPixel products, you can simply leave this argument off…the example code is just being extra descriptive. The point of this setup is that the rest of the sketch never needs to think about the layout of the matrix. Coordinate (0,0) for drawing graphics will always be at the top-left, regardless of the actual position of the first NeoPixel. Why not just use the rotation feature in Adafruit_GFX? The first two arguments are the width and height, in pixels, of each tiled sub-matrix, not the entire display. The next two arguments are the number of tiles, in the horizontal and vertical direction. The dimensions of the overall display then will always be a multiple of the sub-matrix dimensions. The fifth argument is the pin number, same as before and as with the NeoPixel library. The last argument also follows prior behaviors, and in most cases can be left off. With a single matrix, there was a starting corner, a major axis (rows or columns) and a line sequence (progressive or zigzag). This is now doubled — similar information is needed both for the pixel order within the individual tiles, and the overall arrangement of tiles in the display. As before, we add up a list of symbols to produce a single argument describing the display format. The NEO_MATRIX_* symbols work the same as in the prior single-matrix case, and now refer to the individual sub-matrices within the overall display. All tiles must follow the same format. An additional set of symbols work similarly to then describe the tile order. The first tile must be located at one of the four corners. Add either NEO_TILE_TOP or NEO_TILE_BOTTOM and NEO_TILE_LEFT or NEO_TILE_RIGHT to indicate the position of the first tile. This is independent of the position of the first pixel within the tiles; they can be different corners. Tiles can be arranged in horizontal rows or vertical columns. Again this is independent of the pixel order within the tiles. Add either NEO_TILE_ROWS or NEO_TILE_COLUMNS. Finally, rows or columns of tiles may be arranged in progressive or zigzag order; that is, every row or column proceeds in the same order, or alternating rows/columns switch direction. Add either NEO_TILE_PROGRESSIVE or NEO_TILE_ZIGZAG to indicate the order. BUT…if NEO_TILE_ZIGZAG order is selected, alternate lines of tiles must be rotated 180 degrees. This is intentional and by design; it keeps the tile-to-tile wiring more consistent and simple. This rotation is not required for NEO_TILE_PROGRESSIVE. Tiles don’t need to be square! The above is just one possible layout. The display shown at the top of this page is three 10x8 tiles assembled from NeoPixel strip. Once the matrix is defined, the remainder of the project is similar to Adafruit_NeoPixel. Remember to use matrix.begin() in the setup() function and matrix.show() to update the display after drawing. The setBrightness() function is also available. The library includes a couple of example sketches for reference. That’s a crude example. Yours might be designed for pixels arranged in a spiral (easy wiring), or a Hilbert curve. On a per-pixel basis, Adafruit_NeoMatrix is no more memory-hungry than Adafruit_NeoPixel, requiring 3 bytes of RAM per pixel. But the number of pixels in a two-dimensional display takes off exponentially…a 16x16 display requires four times the memory of an 8x8 display, or about 768 bytes of RAM (nearly half the available space on an Arduino Uno). It can be anywhere from tricky to impossible to combine large displays with memory-hungry libraries such as SD or ffft. Because the Adafruit_GFX library was originally designed for LCDs (having limited color fidelity), it handles colors as 16-bit values (rather than the full 24 bits that NeoPixels are capable of). This is not the big loss it might seem. A quirk of human vision makes bright colors less discernible than dim ones. The Adafruit_NeoMatrix library uses gamma correction to select brightness levels that are visually (though not numerically) equidistant. There are 32 levels for red and blue, 64 levels for green. The Color() function performs the necessary conversion; you don’t need to do any math. It accepts 8-bit red, green and blue values, and returns a gamma-corrected 16-bit color that can then be passed to other drawing functions. FastLED works altogether differently; it’s not a drop-in replacement for Adafruit_NeoPixel, and existing sketches will require some rewriting. Note: FastLED currently works only with RGB NeoPixels; RGBW pixels are not yet supported. At all. You will get incorrect and unpredictable colors. We don’t write or maintain FastLED, and can’t provide software troubleshooting advice. If requesting help with a FastLED NeoPixel project in the forums, we’ll usually ask that you try one of the known-working Adafruit_NeoPixel example sketches to narrow down whether it’s a hardware or software issue. Visit the FastLED web site to get started. Help! My Arduino servo code stops working when combined with NeoPixels! Use a dedicated servo control shield or breakout board, offloading that task from the processor so interrupts are a non-issue. Use a hardware-PWM-based servo library rather than the stock Arduino Servo library. This can provide rock-steady servo timing without interrupts, but can only control a very limited number of servos (2-3), and only on very specific pins. When driving NeoPixels I cannot receive infrared codes on my IR receiver! Just like servos, the infrared library uses software interrupts to poll the IR LED, while the standard NeoPixel library blocks interrupts while NeoPixel are being updated. If you don't constantly update the NeoPixel, IR will work in between updates, but if you update them all the time, you will need to use another library and a microcontroller more capable than an Uno or Mega. Ideally one with DMA so that NeoPixels don't take up any CPU cycles. How fast can I refresh a string of (N) pixels? For a strip of 100 pixels, that’s (100 * 30) + 50, or 3,050 microseconds. 1,000,000 / 3,050 = 328 updates per second, approximately. That’s only the time needed to push the bits down the wire. The actual refresh rate will be something less than this, and can’t be estimated as a single number for all cases. It takes time to process each “frame” of animation. How much time depends on the complexity of the math and the efficiency of the code (for example, floating-point calculations can be relatively slow). The formula above gives a maximum theoretical rate, but that’s just a starting point. Reality in some cases could fall an order of magnitude (or more) below this. For exploratory benchmarking, you can always write code as if a large number of pixels were present, and time the result. The extra output bits will simply be ignored by the strip (or you can even test with no NeoPixels connected at all). That won’t do. Now what? Because NeoPixels use a fixed-frequency clock, options are limited. You can’t switch out for a faster microcontroller and expect substantially different results. One option is to use a different LED type, such as our DotStar or LPD8806 strips, or WS2801 pixels. These can be driven at higher data rates, though they do have some other tradeoffs with respect to NeoPixels (cost, color resolution and/or pixel density). Another is to develop your own code on a more capable microcontroller or an FPGA that drives multiple NeoPixel strips in parallel. One such project — OctoWS2811 for the Teensy 3 microcontroller — is shown later. This sort of thing is a complex undertaking and not recommended for beginners. And even among more experienced programmers, there’s often an unreasonable over-emphasis on data rates when the real bottlenecks lie elsewhere…don’t dwell on this too much unless you can confirm it’s the root of the problem. Can I control NeoPixels using (Board X)? We currently only offer an Arduino library. See the links later for other devices. For anything beyond this, if considering writing your own library, understand that some processors are better suited to the task than others. Read through the timing requirements shown below and determine if the chip in question can synthesize a signal meeting those specifications. An 8 MHz AVR can just barely keep up…anything slower may have trouble, though some hardware-specific hacks (like clever use of SPI) might make it possible. In many cases, assembly language is required. The Raspberry Pi running Linux is a multitasking system, and control may switch among multiple running programs at any time. As such, it’s impossible to guarantee the strict 800 KHz signal required by NeoPixels. You may be able to fudge it for short intervals, but it’s not something that can be counted upon. This is why we use DotStar LEDs for the Raspberry Pi light painting project. If you’re using a recent “M0” development board such as the Adafruit Feather M0, Circuit Playground Express or Arduino Zero, an alternate NeoPixel library exploits these devices’ direct memory access (DMA) feature to operate more smoothly. Advanced Arduino sketches can then use interrupts with impunity, and code that depends on the millis() or micros() functions will not lose time. There’s a corresponding DMA version of the NeoMatrix library as well. Plus a super potent 8-way concurrent NeoPixel DMA library. We offer a companion FeatherWing and breakout board to make connections and level-shifting easier! In addition to the previously-mentioned FastLED library, NeoPixel-compatible libraries have been developed for devices beyond Arduino. Please keep in mind that Adafruit did not develop any of this code and can’t fix bugs or offer technical help. This is Wild West stuff. OctoWS2811: specifically for the PJRC Teensy 3.0 microcontroller board. Uses DMA to drive up to 8 NeoPixel strips concurrently with minimal processor load. Multiple boards can be cascaded for still larger displays. FadeCandy: also for Teensy 3.0. Doesn’t support as many pixels as OctoWS2811, but adds dithering and smooth interpolation for color purists. LEDscape: specifically for BeagleBone Black. Although the BeagleBone is a multitasking Linux system like the not-NeoPixel-compatible Raspberry Pi, this code exploits hardware features specific to the BeagleBone Black to drive hundreds of meters of NeoPixel strip with virtually no processor load. WS2812 LED Driver for Parallax Propeller. xCORE NeoPixel test code for the XMOS xCORE startKIT. Some of these are 3.3V devices. See the “Powering NeoPixel” page for notes on controlling 5V NeoPixels from 3.3V microcontrollers. WS2811? WS2812? Why do I see two different names mentioned? The WS2811 is an earlier driver chip separate from the RGB LED. The data signal is similar, but runs at half the speed. By the time the WS2812 (with integrated LED) was released, a lot of code and projects had already built up around the WS2811 name. Sometimes code “for the WS2811” might actually be for the newer chip, or for either type. The Adafruit_NeoPixel library supports both. The WS2812 datasheet explains the data transmission protocol. This is a self-clocking signal — there’s only one wire, not separate data and clock lines. “1” and “0” bits are indicated by varying the duty cycle of a fixed-frequency square wave. Note that there’s nearly 25% “wiggle room” in the timing. So if your code can’t match the recommended times exactly, it’s usually okay, as long as it’s close. There are three bytes of data for each pixel. These should be issued in green, red, blue order, with the most-significant bit first. The data for pixel #0 (nearest the microcontroller) is issued first, then pixel #1, and so forth to the furthest pixel. This does not operate like a traditional shift register! You may want to dig through our Arduino library for insights. The timing-critial parts are written in AVR assembly language, but it’s extensively commented with C-like pseudocode. This guide was first published on Aug 30, 2013. It was last updated on Aug 30, 2013. Build a Daft Punk Thomas Helmet with bluetooth control! Decorate with MicroPython-powered holiday lights you control from a web page! Make the most of your NeoPixels on the Circuit Playground! Unleashing the power of the NeoPixel!